Kathryn Hall and the Hall Wine Club and marketing team hit the road this week with their Regional Release Tour to celebrate and promote the release of the flagship Kathryn Hall Cabernet Sauvignon for the 2015 vintage. We attended the Chicago event held at the W Hotel, conveniently located a short walk from the office. 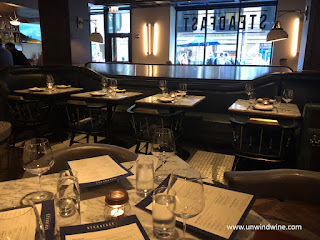 Before dinner we dined at Steadfast in the Kimpton Gray Hotel, another one of Chicago’s celebrated historical buildings. The gray Georgia marble dining room has been granted landmark status by the US Historical Society. This was our first visit to this new establishment of the Fifty50 Restaurant Group that features New American cuisine in a chic, trendy upscale, chef-driven restaurant. The headliners are two noted up and coming chefs, Chris Teixeria and Ender Oktayuren. 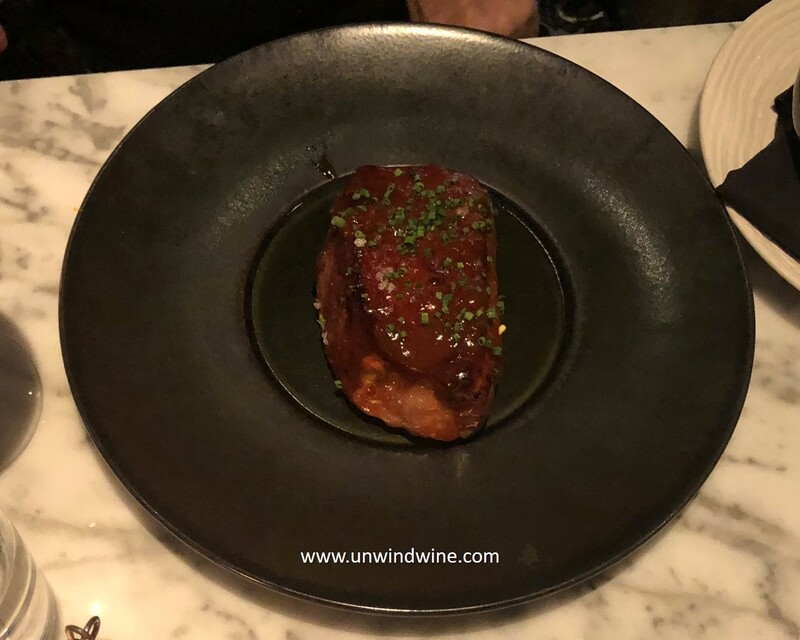 Executive Chef Chris Teixeria was James Beard Award semifinalist in the "Rising Star Chef of the Year" competition for his work at Homestead on the the Roof in 2015. 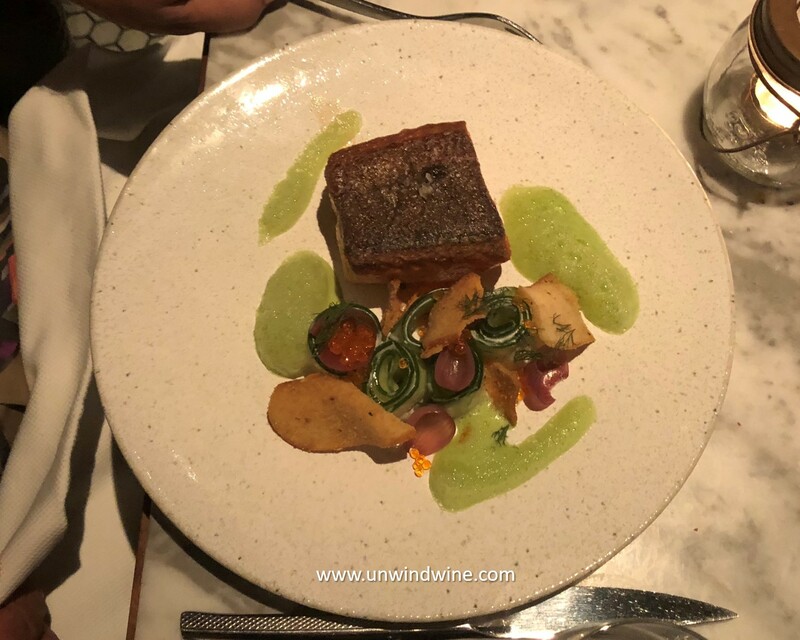 Chef Ender trained and competed with 5-Time Olympic Medalist Chef Tim Bucci, and was Executive Chef at World of Whirlpool in Chicago and was Garde Manger Sous Chef at Sixteen in Trump Tower and Hotel when they earned their Michelin Star. 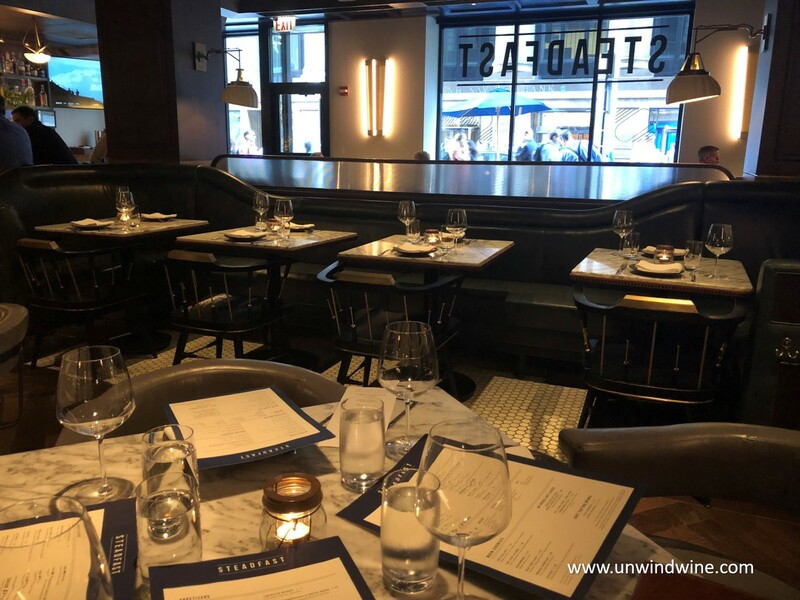 Steadfast is located in the center of the Chicago Loop in Financial District, near the Theater District. 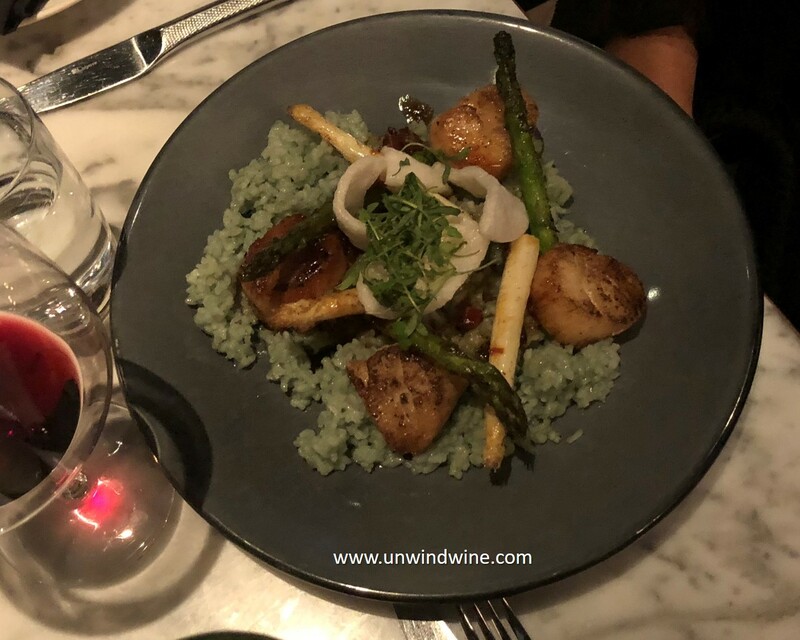 The atmosphere is cosmopolitan, high energy, airy and light, but a bit noisy, fitting for the urban setting but not best suited for a business or intimate dinner. 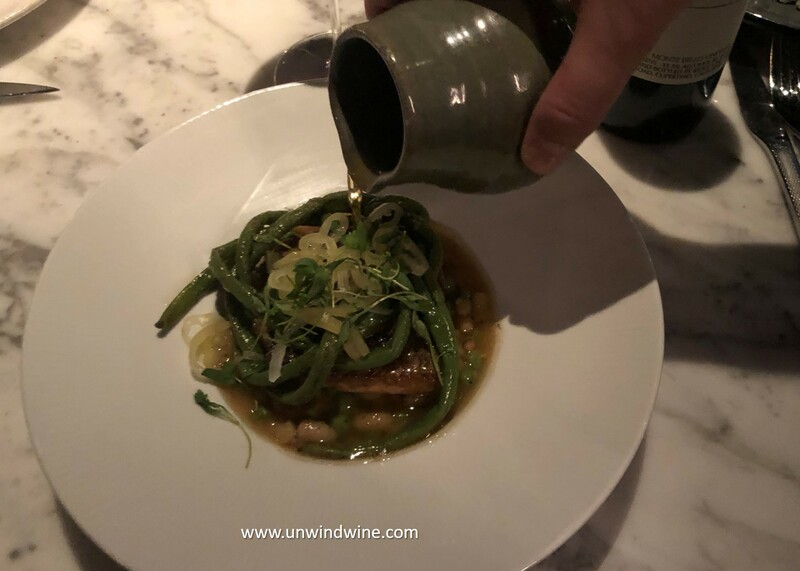 Steadfast offers a carefully selected sufficiently broad winelist for the menu. As usual, we studied the list ahead of time and already had our selection pending any specials or other discoveries once on site. We were looking forward to introducing to fellow diner and 'Pour Boy' Dr Dan a wine featured and collected during our recent Seattle Culinary and Washington Wine Tour and our visit to the Long Shadows Wine Cellars . We wrote in these pages recently of our visit to Long Shadows Winery tasting room in Woodinville, WA and joining their top level wine club to ensure access to their selection of wines crafted by notable world class winemakers. Indeed we intend to share our three case allocation between son Ryan and Dr Dan. Hence, I was looking forward to present and showcase to Dan one of the selections, Long Shadows Pedestal Merlot, crafted by Michael Rolland, PhD and winemaker from several of the world's most exclusive wineries from Bordeaux and California. Pedestal Columbia Valley Merlot 2015 is blended w/ Cabernet sauvignon, Cabernet Franc and Petit Verdot. Alas, Manager and Sommelier Daphne advised us they had just sold their last bottle of Pedestal. This forced an audible to select another wine suitable for the dinner, but not big, bold and robust so as to overshadow the upcoming tasting to come. 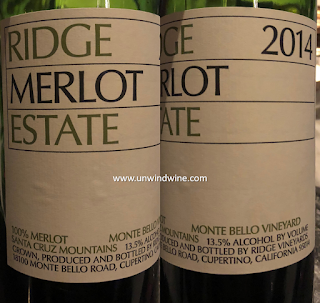 Being predisposed to drink a Merlot we opted for the Ridge Monte Bello Vineayard Merlot, 2014. 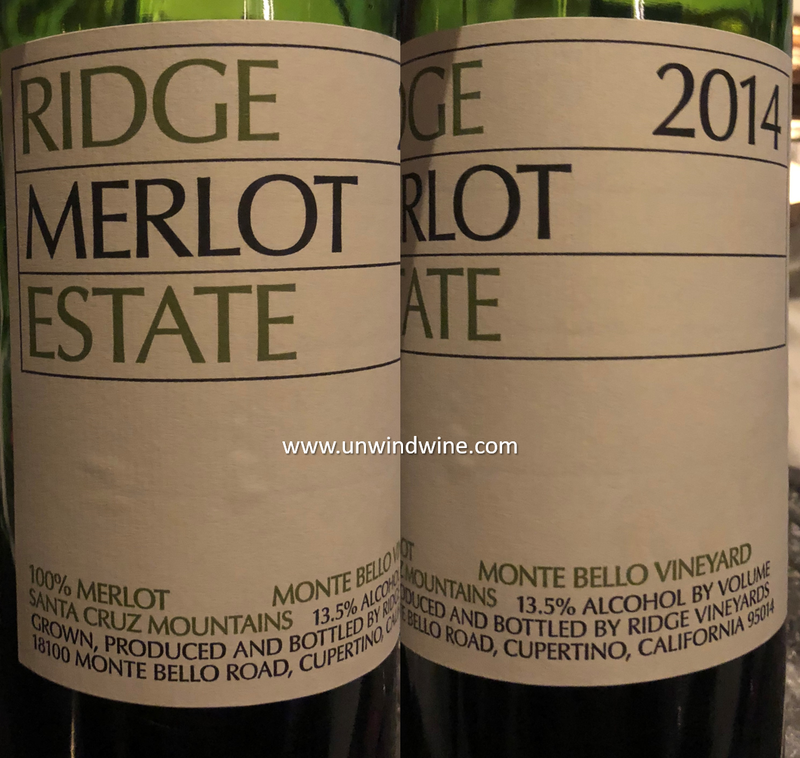 Ridge Monte Bello estate and vineyard sit high atop the Santa Cruz Mountains above Silicon Valley to the east and the Pacific coast just fifteen miles to the west. It lies in the Santa Cruz Mountains AVA, California’s coolest cabernet producing area. The Monte Bello vineyard ranges in elevation from 1300′ to 2700′ above sea level. Its distinctive terroir of soil, elevation, exposure and cool climate, produces wines that are impeccably balanced and capable for long-term aging. They are known for their firm acidity and minerality. While not in the better known Napa or Sonoma, Monte Bello Vineyard is planted in Bordeaux varietals and the flagship Ridge Monte Bello Label, a Bordeaux Blend, has often been called America’s First Growth, as it has a long history and is one of the finest domestic examples of a classic Bordeaux blend. This label, branded the Estate Merlot, is 100% Merlot sourced from the famed vineyard. in which cabernet sauvignon predominates. Winemaker notes: "The 2014 reflects the driest year on record that brought significant water stress to the vineyard. After twenty-one months’ aging in American oak, this complex Merlot has developed wonderfully and will be most enjoyable over the next ten years. Saturated ruby color. Ripe cherry fruit, chaparral, black tea, toasted oak, and clove spice. Well-defined mountain fruit entry, rounded tannins, sweet oak, lengthy finish showing limestone character." We found this dark garnet colored, medium full bodied, bright vibrant forward bold Cherry and Black Berry fruit flavors with sprites of clove spice and black tea, sweet oak and full rounded lingering tannins with bright acidity.